If you run Walking for Health groups and have spaces available you can fill them up by running a Facebook Ad campaign. You can even target women aged 55+ from deprived areas, which will help you hit your targets for reaching inactive people from hard-to-reach groups. 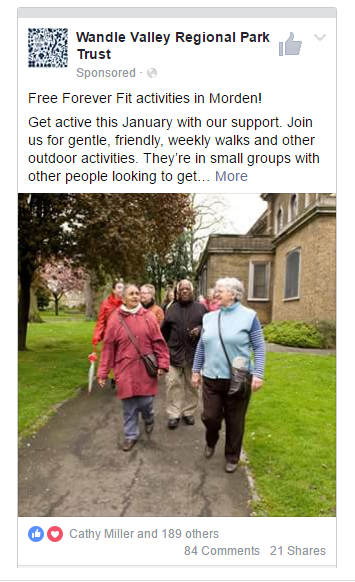 We have used this approach recently in a campaign we ran for Get Active Wandle Valley and it has brought over 150 enquiries and tripled the size of the walking groups. Deal with all the enquiries that come in! The most important part of any ad is an offer that appeals to your audience. You have to make sure that what you’re offering is something that your target audience wants. 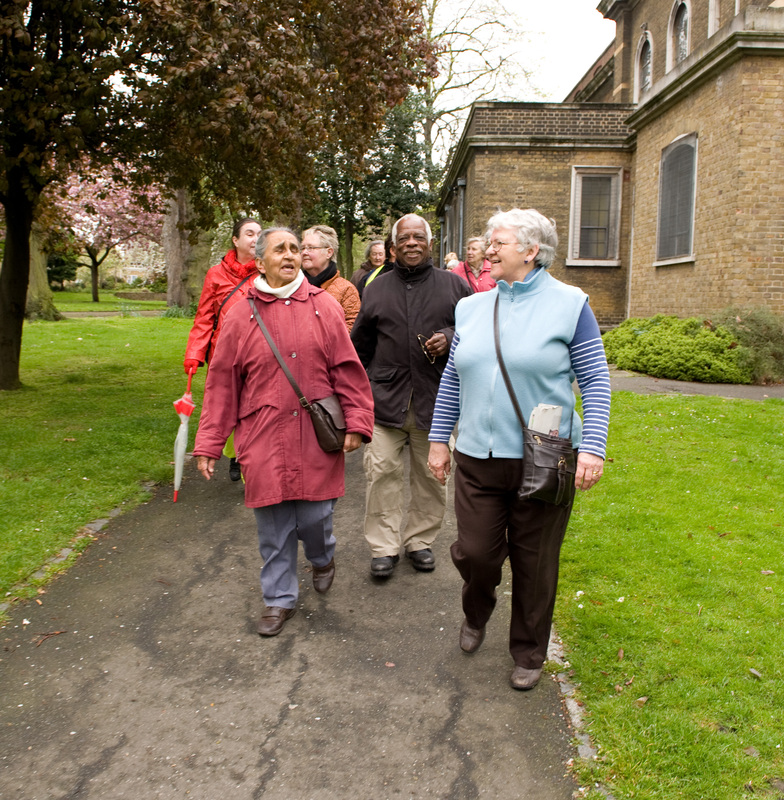 Walking for Health have found that free walking groups appeal most to women aged 55+, so this is who you should target. Men do take part, but only 10% of walkers are men, and you shouldn’t try to promote something that people don’t want to do – you’ll just waste your money. Here’s an example of a headline to explain the offer – FREE Forever Fit activities in Morden! Facebook is mostly a photo (and video) site. If you go on Facebook you’ll see that nearly every post has a photo. This is what grabs people’s attention – so you’ll need to have a great image. Photos that work best are ones where you can see the people’s faces, and they look like they’re having a good time. Here is an example of an image that has worked well in one of our ads. Get active and meet new people. Join us for gentle, friendly, weekly walks and other outdoor activities. They’re in small groups with other people looking to get active again, led by a trained leader. The group stays for tea and a laugh afterwards. We’d love you to join us! The most effective Call to Action in Facebook Ads is to tell people to sign up by clicking on the button below. Facebook have created a system called Lead Ads which makes this super simple for the user. All they have to do is click sign up, and their name and email address are pre-filled, then they click submit. Learn more about how Facebook Lead Ads works. That’s all the main steps to creating your ad.